The Norfolk Strategic Framework (NSF) consultation ran from the 2nd August to the 22nd September 2017 and since then then Norfolk’s Local Planning Authorities (including Norfolk County Council) have been reviewing all comments made, preparing responses and updating the document where this has been deemed necessary. In early January 2018 a new updated version of the NSF was released for public view. Agree shared objectives and strategic priorities to improve outcomes for Norfolk and inform the preparation of future Local Plans. Demonstrate compliance with the duty to co-operate. Find efficiencies in the planning system through working towards the establishment of a shared evidence base. Influence subsequent high level plans (such as the Strategic Economic Plan). Maximise the opportunities to secure external funding to deliver against agreed objectives. The project has been underway for over a year and four working groups have been established to pull together a shared evidence base on housing, employment, infrastructure and delivery issues. The working groups consist of Local Authority staff assisted by other organisations including the Environment Agency, Natural England, Anglian Water, UK Power Networks, Homes and Communities Agency and the New Anglia Local Enterprise Partnership. The rail network serving Norfolk is sparse: few settlements are connected to the rail network, and the network serves few destinations out of the county. There are two lines from London: the Great Eastern Main Line from London Liverpool Street via Ipswich to Norwich; and the Fenline / Great Northern Route from London King’s Cross via Cambridge to King’s Lynn. 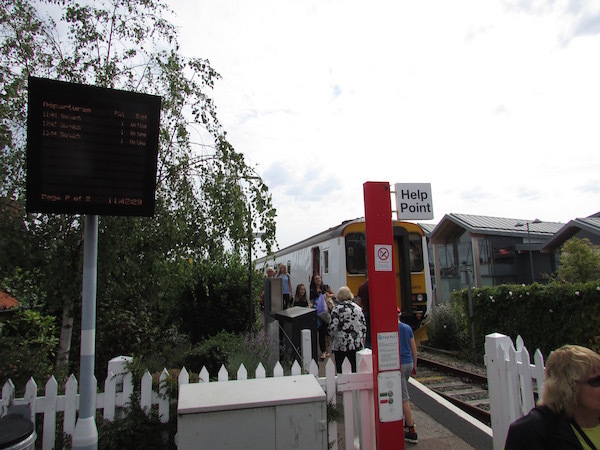 (King’s Lynn also has one train per day to London Liverpool Street.) 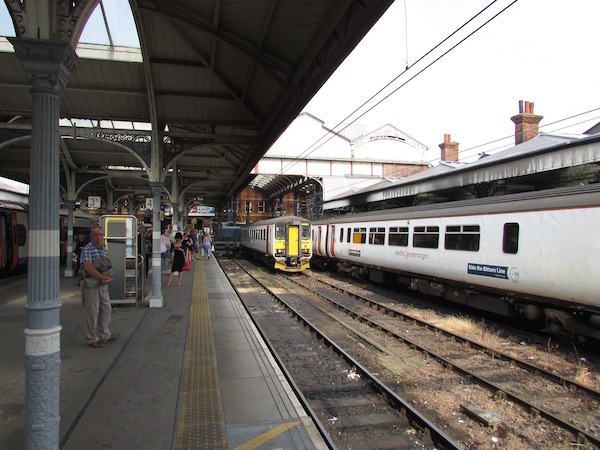 Norwich is directly connected to Cambridge, Great Yarmouth, Lowestoft and Sheringham; and longer distance services via Peterborough to Liverpool. Journey times by rail to major destinations outside the county are lengthy: for example it takes nearly two hours to get to London from Norwich, and four hours from Norwich to Birmingham (see Appendix, Figure A7). Nine of the 21 Norfolk market towns are directly served by rail. Some of the larger market towns are some distance from their nearest rail connection, for example Dereham and Fakenham are both over half an hour travel time from the nearest station (see Figure 4). Rail provides an important travel choice for commuters into the main centres, albeit only for those with a convenient service available. Norfolk has a very limited rail network, meaning that few of its towns are served by rail. Also, the services offered provide a very limited range of destinations and many have only one train per hour. In particular, services to the Midlands and Home Counties are poor. Whilst rail generally provides faster journeys to other major centres compared to road, average rail speeds compare poorly with connections between major centres out of the county (eg York to London) (see Appendix, Figure A7). Norwich station is by far the busiest of all Norfolk stations. Usage has almost doubled in the past ten years, to over 4 million passengers per annum. The second busiest station is King’s Lynn. 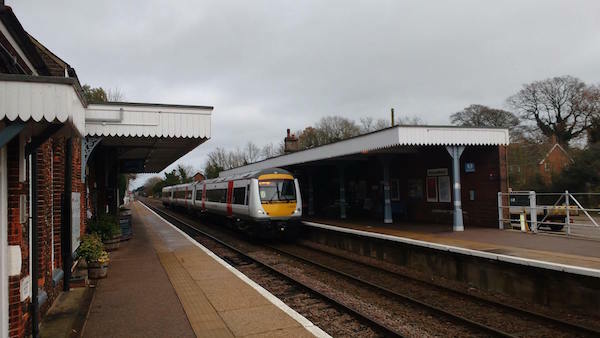 The importance of the lines to London is demonstrated by Diss being the third busiest station in the county, and Downham Market the fourth. (See Appendix, Figure A8.) Patronage at Norfolk stations on the King’s Lynn to London line has increased in recent years. Conversely, at Great Yarmouth patronage fell by 5% over the last year, relegating the station to fifth busiest station with around 440,000 passengers. Whilst station usage has increased dramatically over the last ten years there are signs of the increase levelling off in the last two years. Some lines are reaching, or are at, capacity at peak times: the Bittern Line; services to Cambridge; and London services (Norwich services tend to be full towards the southern, London, end of the route only whereas King’s Lynn services can be full north of Cambridge). In describing lines as ‘at capacity’ it should be noted that this means that the existing trains, at their existing frequencies, are full. However, operators cannot lengthen trains because they do not have rolling stock that can be used and / or the infrastructure cannot accommodate longer trains, for example the platforms are not long enough. Additional frequencies cannot be provided because of – again – rolling stock and / or infrastructure constraints. 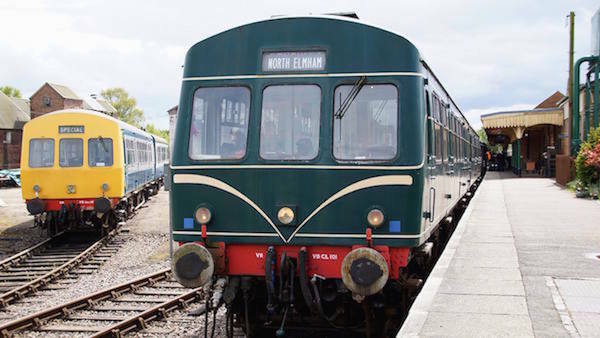 A number of stations on rural lines have very low usage – fewer than 100 per annum in the case of Buckenham – which is a reflection of both low catchment areas as well as infrequent services. The frequency of rail services from Norwich to Cambridge and Peterborough (for onward services to the north and the Midlands), and from King’s Lynn south to Cambridge and London, is limited by infrastructure at Ely. Here, the available track capacity, its layout, and the numbers and arrangement of level crossings restrict the numbers of services that can pass through. Across most of the network journey times are limited by infrastructure including the numbers of level crossings. Only the London lines (to Norwich and King’s Lynn) are electrified; all other services need to use diesel rolling stock. 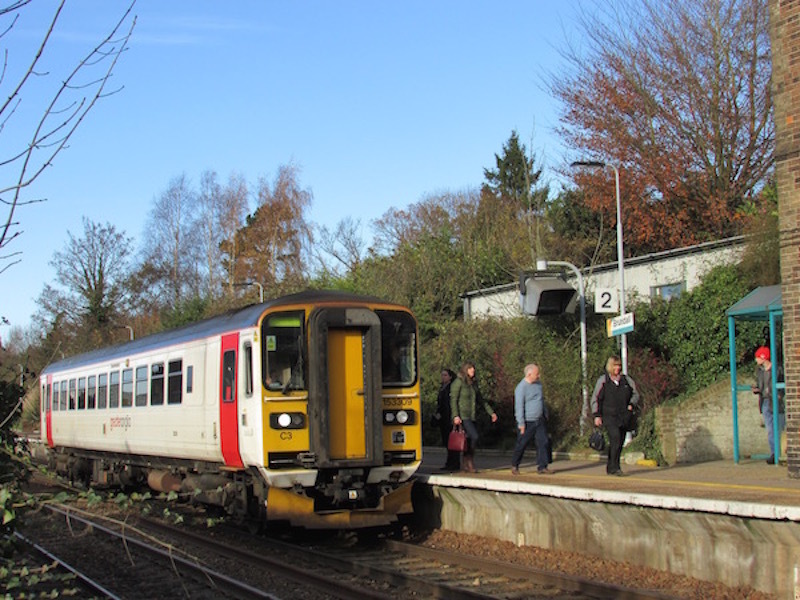 There is a national shortage of diesel stock, meaning that additional services – in the form of higher frequencies – or longer trains cannot be provided. Shortages of stock can also lead to disruption on existing timetabled services in the case of, for example, train breakdowns. Bittern Line from Sheringham to Norwich in peak times. These trains can be full from south of North Walsham in the morning peak coming in to Norwich. Cambridge to Norwich in peak times. Again, these services can be full coming in to Norwich in peak times, and also between Cambridge and Ely due to Cambridge commuters. London to Norwich. These services are full going in to London in the mornings towards the south of the line, and again coming out of London in the evenings. Passengers can have to stand all the way to Ipswich. Journey times and rail frequencies between main economic centres (within the county and to major destinations outside) Figure A7 in the appendix shows journey times and frequencies to a range of destinations. For business trips, business people need connections to markets and suppliers and – ideally – need to be able to get there and back in half a day (including time for the business part of the trip as well as travel time); although will accept a full day. It can be seen from the table that few destinations offer easy half-day connections with even trips to Cambridge involving 2 hours 40 travel time from Norwich (there and back and excluding any wait time or travel to and from the stations at either end). King’s Lynn to Cambridge, at 45m each way, is more convenient but hampered presently by a frequency of every hour outside of the peak times. Some trips, such as to Birmingham, are difficult even given a whole day (eight hours train travel time (from Norwich) alone). Within the county out of peak times all services except Norwich to Diss have hourly frequency, which militates against use of the train for business people. Otherwise journey times are reasonable. However, the main issue is lack of connectivity. Only nine of the 21 market towns are directly served by rail. Some of the larger market towns are some distance from their nearest rail connection, for example Dereham and Fakenham are both over half an hour travel time from the nearest station (see Figure 4). Even where towns are connected to rail, there are often no direct connections. King’s Lynn to Norwich by rail for example takes 2 hours 20m because travel involves going via Ely where there is a need to change trains. The National Travel Survey 2015 shows that the average duration of a commuter journey in the UK is 31 minutes. 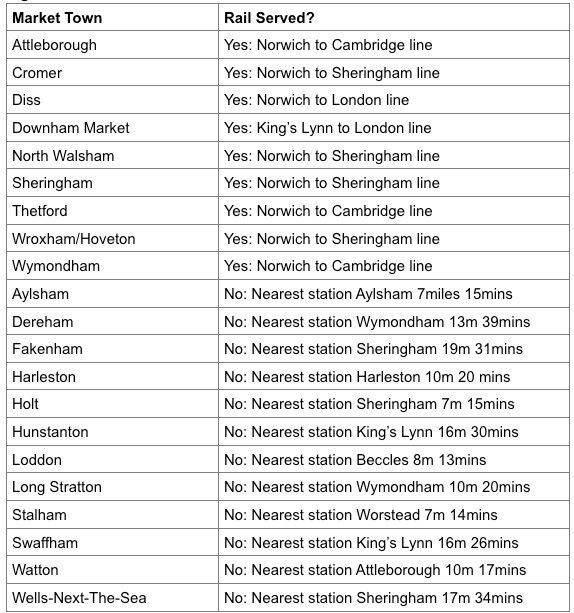 The following figure shows rail journey times into Norwich, King’s Lynn and Great Yarmouth. This illustrates that, for people living close to or having easy access to stations (and their workplace being conveniently sited for the station), rail provides an important travel choice into the main centres. Access to airports is covered below in the Access to International Hubs section. 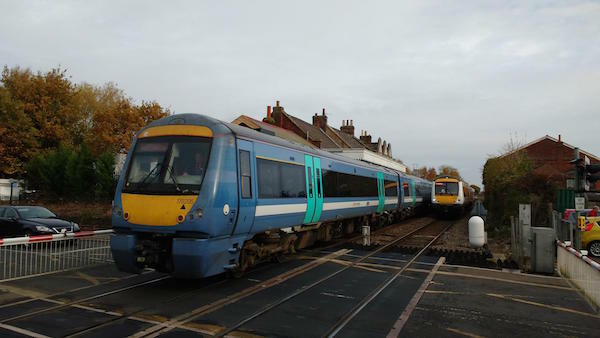 For cross country services, including Norwich to Cambridge, Network Rail’s study states that – although there are some issues regarding crowding presently – the main driver for improvement is better connectivity rather than accommodating peak capacity. The study recognises the need for half hourly services on the route. 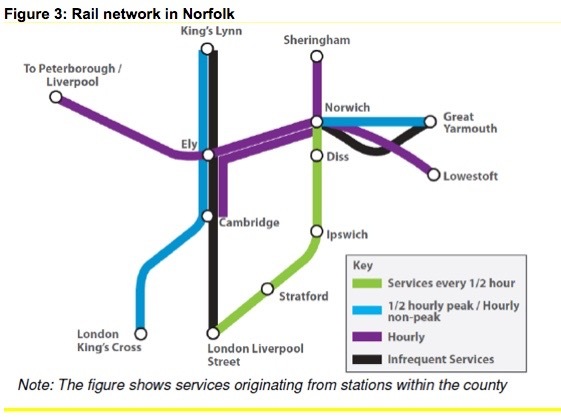 The study also notes that “Kings Lynn to Cambridge [is] also infrequently served; as such, the Route Study investigates the feasibility of improving the frequency of services” to half hourly. The main barrier to additional Norwich and King’s Lynn to Cambridge services is the capacity for trains through the network at Ely. It is interesting to note that in this document and indeed in the framework there seems to be no mention of reinstating former rail routes or developing new ones. 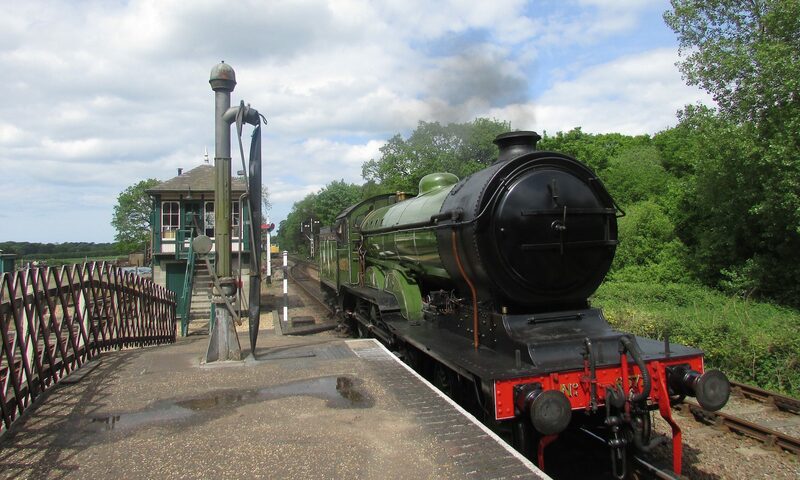 Neither do we see suggestions or discussions to be had with heritage railways to look at options for linking to mainline stations or working with train operating companies. Should there be? This document is draft. Comments on it from all those interested in the future of the County will be welcome. This will inform an amended version of the document which will be considered at the Strategic Planning Member Forum later in the year before formally being considered for adoption by each of the participating bodies thereafter. Next PostNext Whitwell and Reepham Railway track laying plans.